Buildings used to be constructed over cellars. Cellars were dank, dark places where coal was stored. People never intended to live in cell ars. Now we have things called basements that have pool tables, media centers and play rooms. Cellars were easy to construct – rubble, stone, bricks and sometimes block. If they got wet or were damp so what? Basements are different. They are not easy to construct if we intend to live in them. They need to be dry, comfortable and keep contaminants out. Over the last 50 years there has been a notable expansion of living space. The useful conditioned space of building enclosures is expanding to the outer edge of the building skin. Attics, crawlspaces, garages and basements are valuable real estate that are being used to live in or used for storage or places to locate mechanical systems. Basements are viewed by many as cheap space that can easily be incorporated into a home. Keeping basements dry, comfortable and contaminant free is proving to be anything but simple. The fundamentals of groundwater control date back to the time of the Romans: drain the site and drain the ground. Today that m eans collecting the run off from roofs and building surfaces using gutters and draining the water away from foundation perimeters. Roof and façade water should not saturate the ground beside foundations. Grade should slope away from building perimeters and an impermeable layer should cover the ground adjacent to buildings. A free draining layer of backfill material or some other provision for drainage such as a drainage board or drainage mat should be used to direct penetrating groundwater downward to a perimeter drain. The perimeter drain should be located exterior to the foundation and wrapped completely in a geotextile (“filter fabric”). A crushed stone drainage layer under the basement slab should be connected through the footings to the perimeter drain to provide drainage redundancy and to provide a temporary reservoir for high groundwater loading during downpours if sump pumps fail during electrical outages (if gravity drainage to daylight is not possible). Groundwater exists in more than the free-flowing liquid state. Water from wet soil canal so wick (capillary flow) and move by diffusion through the soil and the materials used to make basements. Therefore the basement wall should be damp-proofed and vapor-proofed on the exterior and a capillary break installed over the top of the footing to control “rising damp”. Damp-proofing and vapor-proofing in these locations is often provided by a fluid applied coating of bitumen. In the past, capillary breaks over footings were not common. They were not needed when basement perimeter walls were uninsulated and unfinished on the interior, because these conditions permitted inward drying of the migrating moisture. For finished basements they are an important control mechanism. Without them, moisture constantly migrates through the foundation, and then into the interior insulation layer and interior gypsum board lining. 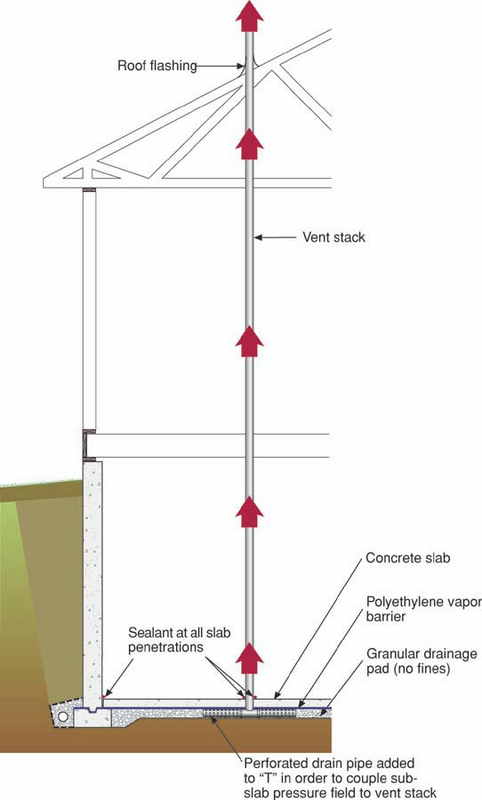 A capillary break and vapor barrier should be located under concrete basement floor slabs. Crushed stone or coarse gravel acts as an effective capillary break and sheet polyethylene in direct contract with a concrete floor slab acts as an effective vapor barrier. The concrete slab should be sealed to the perimeter basement wall with sealant (the concrete slab becomes the “air barrier” that controls the flow of soil gas into the basement). 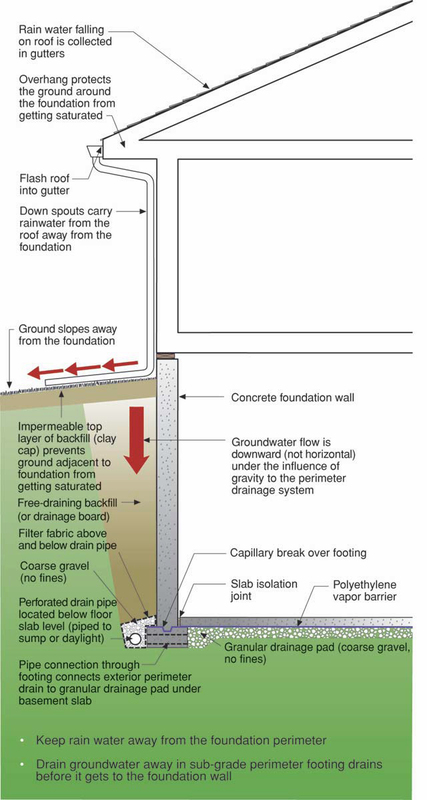 The drainage layer under the basement concrete slab should be vented to the atmosphere to control soil gas. Atmospheric air pressure changes are on the order of several hundred Pascal’s (an inch of water column) so that the soil gas vent stack is in essence a “pressure relief vent” or “soil gas bypass” to the atmosphere. Perforated pipe should be attached to the vent stack to extend the pressure field under the slab to the foundation perimeter and to the drainage layer outside the walls. Pipe connections through the footing extend the pressure field further to the exterior perimeter drain (as well as providing drainage redundancy as previously noted). The traditional approach to basement water control has been to place the barrier and control layers on the outside and then allow drying to the inside. Drainage, dampproofing or water-proofing and vapor control layers have historically been located on the outside of basement perimeter walls and crushed stone layers and plastic vapor barriers have been located under concrete slabs. The operative principle has been to keep the liquid, vapor, and capillary water out of the structure and locate vapor barriers on the outside – and allow inward drying to the basement space where moisture can be removed by ventilation or dehumidification. 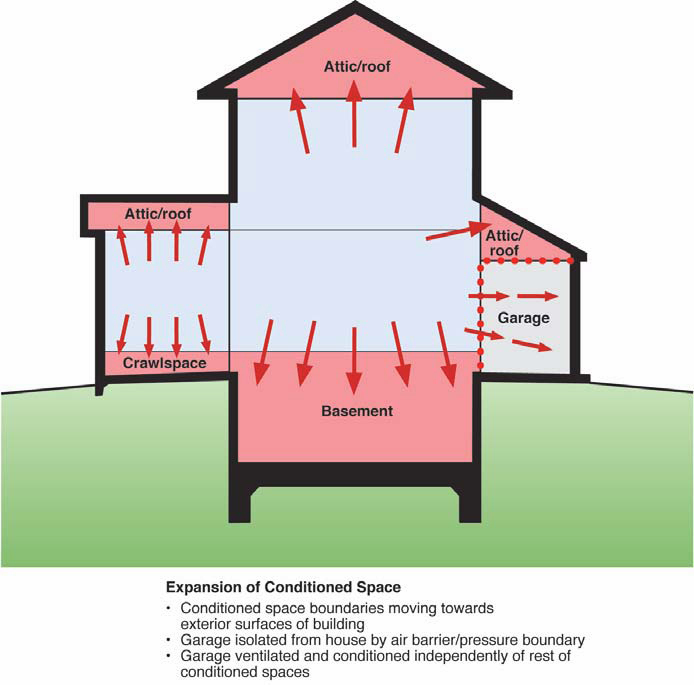 The approach to basement soil gas control should be to allow pressure relief by creating pressure fields under and around basement foundations that are coupled to the atmosphere – intercepting the soil gas before it can enter the structure and providing a bypass or a pathway away from the conditioned space.